Two weeks ago we ran an interview with BinaryPlex co-founder Tim Bull and spoke about his company’s new twitter tool – Tribalytic. Well Melbourne-based Tribalytic has now fully launched and is already identifying hidden nuggets of value for Australian businesses in Twitter conversations. 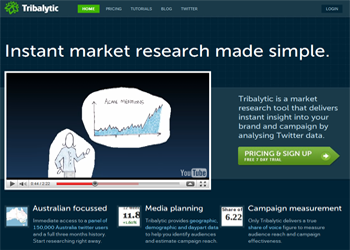 The way Tribalytic does this is by using a market research based panel approach, which means that it constantly listens to over 150,000 Australian Twitter users. This allows businesses to research broadly across any related issues. The company says that this offers significant benefits over typical monitoring tools which only listen to the conversations of the specific keywords you enter. “Businesses are maturing in the way they use data from social media” said Bull. “Facebook is more restrictive when allowing third-party tools access to its data and if you already have a fan page, it has tools built into its platform which allow you to analyse your demographics,” says Bull. If you’re keen to check out Tribalytic for your business you can signup for a free trial at http://tribalytic.com including daypart (time of day) analysis, location demographics, influence measurement and the ability to quickly and easily segment and identify the conversations around any terms used by the panel of Australian Twitter users over the past three months. And, if you’re interested in finding out some of the quirkier things Tribalytic has discovered about Australian Twitter users then check out the Tribalytic blog.